It's finally here! The 2009 Back From The Depths Hallowe'en Special is an anthology horror comic that's not for the nervous, inspired in part by the short-lived Scream! title published in the 1980s. The comic, which includes contributions from creators such as David Hailwood, Malcolm Kirk, Tim West, Andrew Milne, Dave Windett and John Gatehouse is available as a totally free pdf file from the Back from the Depths forum or via Clickwheel. I particularly enjoyed The Golem Rises by Mister Roberts, with art by Simon Mackie; Mo Ali and Brian Gorman's Avenger; Bucket of Blood, written by Andrew Milne & Carol Kewley, with art from Matt Soffe; and the fun features such as "How to Sell Your Haunted House"! Internet spooks delayed the arrival of DC Thomson's latest information on its new issues of war digest Commando, but thanks to a bit of counter espionage from downthetubes and the Dundee offices of the monthly magazine, we're finally able to bring you details of comics on sale in November. As usual, the latest offerings comprises two new and two reprint titles. "The two reprints this month were drawn by guys who are still working for us," says editor Calum Laird, "and anyone who has bought copies in the last month or so can compare then and now to see that their stuff is still as good as ever. "Ian Clark, who wrote Rag Tag Army was a real stalwart of Commando, although I first came across him as the author of photo-stories on teen title Blue Jeans!" The invading Japanese stood between "Bobby" Chang and his dream of going to America. As an orphan in war-torn China he had little hope of realising his dream − unless he could help get rid of the Japs. Colin's first Commando story, Fight Fire With Fire, was published in June as Issue 4202. "He's a relatively new writer to us, one of a couple of new guys we've brought on board," Calum reveals. The end of the Napoleonic Wars was a mixed blessing. There was an end to the slaughter but men who had only know military service found it hard to settle in to normal life. • Chris Weston reports on his new 2000AD Future Shock, "Whatever Happened to the Green Pedestrian Palm? ", which appears in 2000AD's Christmas issue, Prog 2010, on sale 16 December 2009. "It is cearly inspired by the star of Seventies Public Information Films, The Green Cross Code Man, whose previous comic-strip exploits were handled by The Govenor himself, Mr. Dave Gibbons..." Expect some merry mickey taking of merchandise superheroes, including Mr. Muscle. • Comics Are Good For You: but that's the message from Carol L. Tilley, a professor of library and information science at the University of Illinois, who insists that looking down upon graphic novels as being inept at benefiting the children is a mistake. She argues comic books are as valuable as any other form of literature to be a part of children's education. So ditch those books and break out the Beano now! "A lot of the criticism of comics and comic books come from people who think that kids are just looking at the pictures and not putting them together with the words," Tilley said. "Some kids, yes. But you could easily make some of the same criticisms of picture books -- that kids are just looking at pictures, and not at the words." More on this story here on Science Daily. • We're sorry to report the passing of Belgian Josette Baujot, who has died aged 88, was responsible for colouring Hergé's Tintin albums for more than a quarter of a century during the peak years of his popularity, and established the "colour code" that helped take Tintin far beyond Belgium and France to an international audience. Phil Davison pays tribute to the colourist in The Guardian here. • Comics-related podcast Small Press Big Mouth dropped by CD24's table at BICS 2009, and bought a copy of the Jack in the Box graphic novel. There's an audio review on episode 11 of their podcast, and they've got some really nice things to say about the book and are "infectiously enthusiastic" about the comics scene in general, and you may find some rather cool recommendations (apart from Jack in the Box) if you're stuck for something to read! • And finally... for those of you who are fans of Alan Moore but are not necessarily on the Alan Moore Yahoo! Group mailing list, Pádraig Ó Méalóid tells us there has recently been a YouTube channel set up to collect all of Alan's appearances that are on YouTube. "We're still adding things to it, so it's by no means complete and definitive," says Padraig, "but it's a good start, at the very least. "One of the things I'd particularly draw your attention to is the most recent posting, under the name of Alan Moore Swamp Thing Interview. A wee while back I bought a video on eBay which turned out to be something he'd done for DC in about 1985, which I believe was for showing in comics shops and the like, where Alan talks very enthusiastically about his work on Swamp Thing, and about his forthcoming work on Watchmen. With the help of a few different people, I got this put up on YT, as I'm no good with technical stuff, and anyway it's a US video. It's kind of sad to see how enthused he is there, compared to how he feels now after how we was treated by DC." The Winter 2009 auction at British auction site Compalcomics is now open and includes a mix of gems, including rare Frank Bellamy artwork from Eagle and more. Issues of Beano, Dandy and Wizard from the war years are again on offer in this auction, and there are further complete years of Beano bound volumes for 1947, 1950, 1956 and 1968. Also on offer are the first issues of Hotspur, published in 1993 and Tiger Tim Weekly, published in 1920; bound volumes of the 1930s Modern Boy title, featuring Biggles stories; plus a complete 136-issue run of Lion Picture Library and the rare Front Line Picture Library one lot ahead of it. Artwork offered includes the usual appearance of pages featuring Desperate Dan, Oor Wullie and The Broons, but some Garth strips by Martin Asbury and two magnificent boards by Frank Bellamy of Montgomery Of Alemein and Heros The Spartan, both published in the Eagle, are sure to catch the eye of the artist's many fans, just as Dan Dare fans are sure to bidding to buy the Dan Dare Walkie Talkie on offer - an item produced by Merit. However your favourite could be an early Dennis The Menace artwork by Davy Law in which he hilariously... no, we'll let you enjoy wander over to the auction site itself to enjoy it. Girls comics continue to sell well and Diana (featuring The Avengers TV series strip) Princess, Schoolgirl's Own, June And Schoolfriend are all hockeying for your attention. Marvel UK fans have something to vie for, too, with first issues of several 1980s titles on offer in one lot, all with free gifts - Future Tense, Marvel Action, Marvel Team-Up, Super-Adventure, Star Wars, Captain Britain and Thor. Also available is a selection of the first British Superman reprints in Triumph comic (lot 59) and a rare Australian first edition Superman without the 'No 1' printed on the cover. The US section profiles a rare All Star Comics #21 and a fine selection of 1940s-60s Batman and Detective Comics issues, all CGC encased. There's a fresh looking Brave And The Bold #28 at lot 233, a full run of Vampirella and a The Incredible Hulk #181. • You can now access Comic Book Auction's 11 year, 45 catalogue run of comics, annuals and artwork in our searchable database. Over 15,000 lots of comic titles, prices, issue numbers, years and grades all readily available. Just go to the top of the site's home page, click on ComicSearch and find what you need. Inspired by Big Finish's Dalek Empire audio series, here's an animated version of the opening scenes from the first story, animated using Carrara 6, Daz studio and Crazytalk 6. After centuries of peace, the galaxy is invaded by the Daleks. And nothing will ever be the same again... the first story, Dalek Empire I: Invasion of the Daleks, written and directed by Nicholas Briggs stars Sarah Mowat, Mark McDonnell and Gareth Thomas. The narrator, who isn't listed in the animation's credits, is Joyce Gibbs. The work of "android65mar", the animator says he's always had an interest in animation and a fascination with science fiction, particularly Doctor Who and particularly at the moment it seems Daleks. "It must be my age, which I have now decided with all my vanity to be a bit coy about..."
British independent comics publisher Orang Utan Comics have extended their presence on mobile phones with the arrival of its Alpha Gods title on Android, iPhone and iTouch via Robot Comics. Written by Ian Sharman with art by Ezequiel Pineda, Alpha Gods is set in the year 2086, when humanity faces the new threat of the Extra Humans. The government is struggling to cope with the growing number of mutants, aliens and supernatural beings who are living amongst us. People are beginning to panic and so, in 2050, the Department for Extra Human Affairs was established with a remit to try and contain the problem. By 2086 the situation has escalated, so they have formed a new rapid response strike force, the Alpha Gods. Who better to police the Extra Human community than Extra Humans themselves? A standalone Issue 0 is available free, introducing cyborg Paladin and super-powered Impact and other members of the Extra Human Department Affairs. The app offers their first mission in this exclusive prelude to the new superhero comic. Issue 1 now also available as a paid app, containing the free Issue #0 preview plus the entirety of the original Alpha Gods #1. Alpha Gods was originally released for mobile via ROK Comics and is one of a number of comics now being delivered as part of WAP services in India on platforms designed by the same company for Airtel and other mobile networks there. • Alpha Gods #0 is available for free in the Android Market. Scan the QR code right with your Android to receive its url. Alternatively, search ‘Alpha Gods #0″ on the Market. Comics commentator Michael Crouch reports that Radio 4's excellent From Our Own Correspondent show has just aired an item on the Night Witches - the all-women squadrons that fought for Russia during World War 2 and who featured in the Battle Picture Weekly comic strip Johnny Red, first brought to vibrant life by Joe (Charley's War) Coloqhoun but mostly by John Cooper for the bulk of its long run. The show talked to surviving 'Night Witches', who recalled their greatest terror, that of being burnt alive in your aircraft. An extra bullet was always carried in their pistols so that if they crashed behind enemy lines they could shoot each other, then themselves, before the Germans could get them. Noting that Warren Ellis recently revisited these squadrons in his series, The Night Witches, Michael is right to describe it as "a fascinating and horrific period of history." A new collection of Johnny Red stories is in preparation for release by Titan Books next year, the first in an ongoing series. The programme is currently available to hear again on the BBC's iPlayer and all the programmes are regularly available as podcasts. Look for Saturday 31st October's podcast here. There is also a BBC slideshow and audio commentary available here and Radio 4 will be broadcasting a documentary on Monday 2nd November at 8.00pm. Both feature contributions from Garth Ennis and there are some pictures from the graphic novel and series on the slideshow. 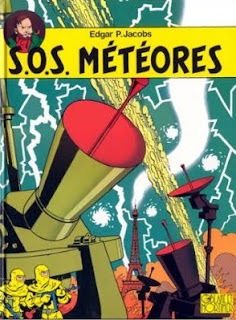 Originally published in 1959 as SOS Météores, this was the eighth of the, to date, eighteen Blake and Mortimer albums. However as Cinebook have been jumping around in the original publication order this is actually their sixth Blake and Mortimer title. Rather than being a Blake AND Mortimer book this is very much a Blake OR Mortimer book as our two heroes arrive in Paris separately and it takes quite some time for them to finally meet up and their story strands to come together. With story and art by the series creator Edgar P. Jacobs, SOS Meteors is set in a 1950s world where a gentleman scientist would know his foreign contemporaries and speak their language perfectly. Indeed the plot would not have looked out of place in the early James Bond films with its international intrigue and science fiction devices. Jacobs' art is ligne claire with nicely detailed vehicles for the protagonists to use throughout the story which does rather revolve around motor vehicles and includes one major car chase. Annoyingly the text size increases and decreases depending on the size of the speech bubbles although this is presumably to allow a workable translation to fit into the original French language bubble size some of which, typically of Jacob's Blake and Mortimer albums, can take upwards of half a panel to tell the ongoing story. But this is a minor complaint and the only real let down of the book is the cover. With its nonsensical machines, jagged lines and garish colours swamping a small Eiffel Tower it is uninspiring, but after forty years promoting the book in the French speaking world it isn't about to be changed now. However don't let the cover put you off. 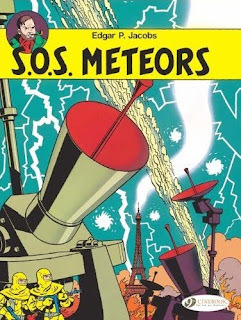 SOS Meteors, with its British characters investigating a science fiction tinged plot in 1950s France, is a good example of Edgar P. Jacobs' Blake and Mortimer stories and does not require any prior knowledge of the characters or situations to be enjoyed. The next Blake and Mortimer title to be published by Cinebook will be The Affair Of The Necklace which is scheduled for January 2010. The details of the English language Blake and Mortimer books are on the Cinebook website. The official Blake and Mortimer website (in French) is here. Century 21 Strip Collection Details Revelead! Trailed here back in July, publishers Reynolds & Hearn have kindly given downthetubes the lowdown on the strips that will feature in their third volume of Gerry Anderson comic strips, most taken from the brilliant 1960s comic TV Century 21, due for release in a few short weeks. Launched in 1965 to capitalise on the success of Gerry Anderson's television series Fireball XL5 and Stingray, TV Century 21 offered a colourful mix of space age stories that later included Thunderbirds and Captain Scarlet alongside other Supermarionation favourites from the Anderson studios. Sub-titled Escape from Aquatraz, this third collection, featuring many pages reproduced from original artwork unseen for over 40 years, includes strips by artists such as Frank Bellamy, Ron Embleton, Frank Hampson, Mike Noble and Ron Turner. Each story has been meticulously restored and the book features an introduction by Chris Bentley and the volume includes a fine UFO strip from the pages of 1970s comic, Countdown, published by Polystyle who also produced TV Comic.